The Huxtables are America’s favorite TV family, according to a YouGov poll published this week. If you don’t know who the Huxtables are, you might be in one of the 3.3 percent of U.S. homes without a TV or you might just be young — their NBC sitcom, “The Cosby Show,” filmed its last episode in 1992. But “The Cosby Show” wasn’t popular only in the U.S.; academics have noted that “its international acceptance remains a virtual mystery.” I was among the enthusiastic foreigners; growing up in the U.K., I would diligently tune in every week. The Huxtables were unquestionably entertaining, but I couldn’t tell whether they were a realistic representation of family life in a country I had never visited. The Huxtables were a sprawling bunch. Sometimes, grandparents would visit the main characters’ Brooklyn brownstone, and sometimes grandchildren or cousins stopped by. But the core of the family consisted of parents Cliff and Clair, and their five children. That’s uncharacteristically big in this decade. According to the 2011 American Community Survey, the average size of a family householdis 3.34 people. If we only look at households with married couples, family size shrinks slightly, to 3.28 people (all of the parents are married in the most-loved TV families, or at least the families YouGov asked about). That’s an important number, because 1 in 5 U.S. households are married couples with children. Neither Cliff nor Clair Huxtable became stepparents when they got married, which makes them different from Carol and Mike Brady (each of whom had three children from a previous marriage) and the Pritchett-Delgados in “Modern Family” (Jay Pritchett is a stepfather). According to the 2010 census, of the 88.8 million children in American households, 4.7 percent are stepchildren. In “Modern Family,” Mitchell Pritchett and Cameron Tucker adopted their daughter, Lily Pritchett-Tucker, a decision that reflects the 2.3 percent of children in American households who are adopted. Almost 250,000 of those adopted children, like Lily, were adopted internationally — 124,000 were adopted from Asia (Lily was born in Vietnam), 61,000 from Europe and 49,000 from Latin America. Although they didn’t have any stepchildren, the Huxtables did have a step-granddaughter, Olivia Kendall. So far, we haven’t taken race into account. The Huxtables were African-American, so that affects how they compare to the statistics today. Of the 8.7 million African American family households, only 3.8 million include a married couple, according to the American Community Survey. Cliff was an ob/gyn and Clair was a lawyer, which makes them even less common, according to the Bureau of Labor Statistics. Just 6.4 percent of U.S. physicians and 4.2 percent of lawyers were African American in 2013. 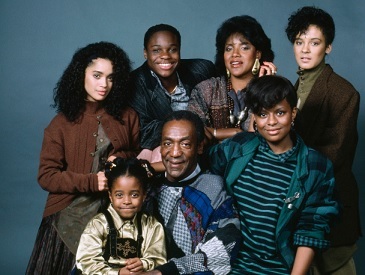 Tags: Average American family makeup, Cosby Show, Huxtable family. Bookmark the permalink.